Page has taught at the Lake campus for the last six years. If Columbia College–Lake of the Ozarks had a golf team, Dr. Ron Page would be first in line to coach the squad … or play if that is an option. 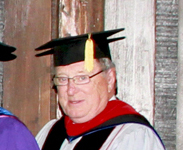 The avid golfer and boating enthusiast has taught religion classes at the Lake campus for the last six years. Page, who retired to the Lake with his wife, Kay, is a Denver Broncos fan and has five grandchildren. Read more about the fan of Tortilla Flats restaurant. 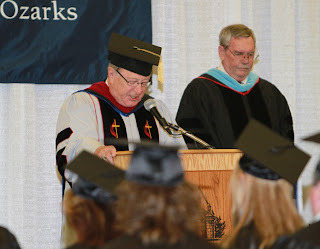 Page offers the invocation at the beginning of every Lake campus graduation ceremony and other events. What is the best part about working at Columbia College–Lake of the Ozarks? The freedom to teach my discipline without someone looking over my shoulder and requiring it be done ‘this way’; the students who take their education seriously and make the effort to do their best; and the great staff and other faculty members who are friendly and fun to be around. What piece of advice would you impart to a student prior to graduation? Education and learning is a journey, not a destination! Talk about your journey and what lead you to Columbia College–Lake of the Ozarks: During my 18 years as part of the administration at Central Methodist University (Fayette, Mo. ), I became very familiar with Columbia College. I knew it was a great school that placed high emphasis on academics. When my wife and I retired to the Lake, I wanted to do something to stay active (physically and intellectually) and teaching part time at the Lake campus seemed to be a great opportunity. It has been! I have truly enjoyed my time here and hope to keep teaching as long as possible.